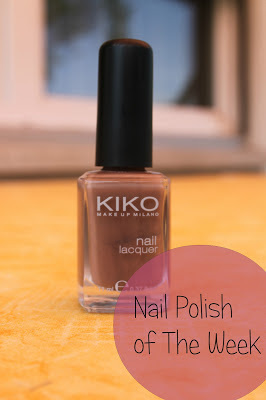 This week I went with a nail polish from KIKO. They have some really pretty colors and everytime I go there, I buy another nail polish to add to my collection. The color that I choose this time is 322 - Caffe Latte. It's a really pretty brown color. What I really enjoy about their nail polishes is that the color dries very fast. I really like the brush too, because it makes painting your naisl quicker. Do you own any nail polish from KIKO? Lovely shade :) Looks quite similar to mushroom by barry M !! OEE that's a lovely color ! !